Along the scenic rocky shores of the Amalfi Coast is the main town of Amalfi, comprising of historic buildings, villas, shops and hotels all perched along the side of the cliff. The winding streets will lead you through the town, as you discover everything it has to offer. Visit the beautifully designed Amalfi Cathedral, wander through the Cloister of Paradise and explore the Paper Mill Museum. Head down to the harbour and grab a bite to eat, as you gaze at the luxurious yachts. Relax for a while on the beach, soak in the clear waters or catch a boat ride to the island of Capri. Cycle around the countryside, hike through the mountains and discover the local lemon farms. Browse the many shops, buy some souvenirs and try the famous local lemon liquor Limoncello. If you’re thinking of Italy for your next holiday, choose this wonderful town, as you won’t be disappointed. Click on each tab to find out more about the beautiful town of Amalfi. The design of this stunning cathedral is unconventional in the sense that it simply doesn’t look like a cathedral. It looks more like a palace, with wide steps rising from the ground up towards a large archway where the medieval bronze doors are located. The architecture boasts an Arabian style and towards the top is a large mural and a large cross that sits at the very top. The interior is even more impressive with light colours and murals throughout. A must-see during your visit to the cathedral is the Cloister of Paradise, which features beautifully designed columns with a Moorish style design and white marble. As you walk around the centre, you will see historic art adorning the walls and in the centre itself is a beautiful Mediterranean garden that gives a lovely contrast next to the white of the cloister. This fascinating museum will give you an insight into the history of paper, something that nearly all of us use every single day. Included in the exhibits here are machines and ancient technologies that were created for one purpose, to make paper. The reconstructions will show you how it was done and you will also learn about how paper was made by hand, without machines. The nearby mountain range of Monti Lattari is the perfect place for a hiking excursion. You will find numerous trails through the rocky landscape, which varies from bare limestone rocks to tree covered hills. The greenery includes chestnut trees and fir trees. The relatively stable climate allows you to enjoy the mountain range throughout the year. You will be conveniently close to the ancient city of Pompeii, which has been almost completely uncovered from the Volcanic ash that devastated it when Mount Vesuvius erupted almost two thousand years ago. Sights here include the Temple of Jupiter and the Temple of Venus. The cobbled streets have been very well preserved, allowing you to see the worn track marks in the stone caused by horse and cart. Booking a boat trip is a great way to see the beautiful Amalfi Coast and if you want to venture a little further afield, ferry trips are available to Naples, and Sorrento. Full day guided boat trips are highly recommended, as you will be taken on excursions to places like Capri and you won’t feel rushed. Alternatively, hire a boat without a skipper and go on your own little adventure. Glide across the glistening blue sea in your very own kayak, as you explore the rocky coast. Take your time, as you paddle along and make sure you look down into the clear water to see if you can spot some of the local marine life. The lemons grown on the Amalfi Coast are said to be some of the most delicious lemons available anywhere in the world, so why not take a trip to a local lemon farm to discover how these huge lemons are grown and what makes them so tasty. Don’t forget to pick up a few samples to take home with you. A great way to see the beautiful countryside without hiring a car is to hire a bike instead. Hire smaller ones for the kids too and have a family day out exploring the area under the clear blue skies. Head inland towards the mountains or stick to the coastal roads, which offer stunning views across the sea. Stay in town and amble around many streets, head down to the beach for a barefoot walk in the water or stroll along the harbour where you will see many luxurious yachts. If you prefer more challenging walks, head to the hiking trails in the Monti Lattari mountain range. This stunning natural formation will give you some of the best views across the landscape. As the closest beach to the centre of Amalfi, Marina Grande is the most popular. It has a lovely stretch of pebbly beach and a selection of sun loungers with umbrellas that are available for hire. The turquoise water is very clear due to the lack of sand and comfortably warm, giving you the chance to enjoy a swim, whilst checking out the marine life. The beautiful beach at Atrani Village is one of the most scenic on the Amalfi coast. It consists of soft black sand due to the areas volcanic past and is backed by a charming promenade. The beach is very easy to access and there are sun loungers available for hire and also parasols should you want to escape from the sun for a while. The water is calm and fairly shallow, giving you the chance to enjoy a swim without having to worry about waves. Along the coast to the east from Amalfi is the town of Ravello, which sits high above the water on top of a cliff. Below the cliff is a small sandy beach, which few know about. It may be small but because it’s not as popular as the better-known beaches, you won’t have to worry too much about finding a good spot. The water is warm and winds are kept to a minimum, as it is surrounded on three sides by cliffs and rocks. At the foot of a towering cliff is the small but pleasant Santa Croce beach. This is just a short distance from the centre of Amalfi and it can be reached on foot or by water. The walk down from the top of the cliff may not be suitable for some, so why not take the regular boat service that runs back and forth between the beach and Amalfi itself. Once here, you can hire a sun lounger with umbrella and enjoy a snack at one of the restaurants on the beach, helping to make it a great choice for families. 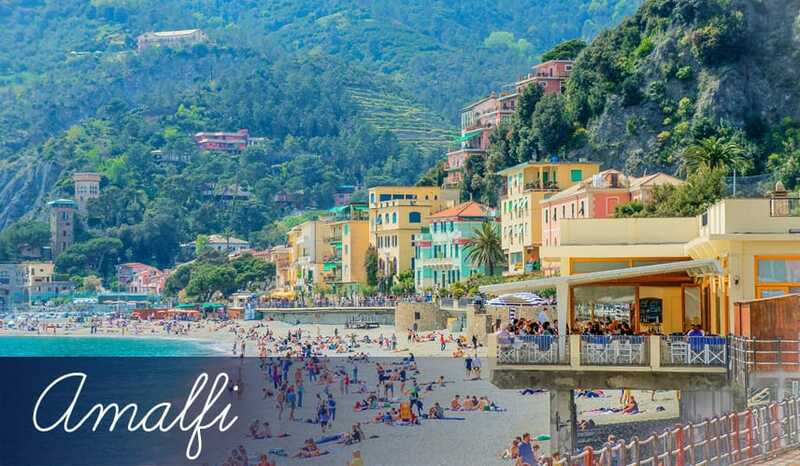 As a traditional Italian town, Amalfi is home to a good selection of amazing restaurants offering traditional dishes made using only the freshest of ingredients. Whether it’s meat, pasta, salad or fish you’re after, you can be sure that it will all be irresistibly fresh and prepared using professional skill. Close to the water’s edge is the restaurants of La Caravella, a lovely restaurant where you can enjoy excellent seafood dishes and delicious desserts. A short distance away near Amalfi’s main square is La Trattoria, an elegant restaurant also serving fresh seafood dishes and a menu filled with traditional delights. From the terrace you can enjoy excellent views of the town as you tuck in to your meal. Ristorante Marina Grande is a modern restaurant offering beautiful views of the sea and a menu filled with local cuisine. The traditional tastes mixed with the modern setting gives a pleasant contrast for you to enjoy. The Il Tari restaurant in the centre of town offers a simple menu consisting of fresh fish, pasta and meats. It’s simple enough for a casual meal but also ideal for those intimate nights out with the other half. Wherever you turn in Amalfi, you will come across some of the many restaurants here serving simply irresistible dishes that you won’t forget, so don’t hesitate to explore the side streets. The nightlife in Amalfi is perfect for those who love to socialise whilst enjoying a drink in the cool evening breeze. There are many cafes and bars along the coast where you can relax but if you’re after some live entertainment there’s plenty of that too. If you love classical performances then you won’t be able to resist seeing the concerts at the Cloister of Paradise, which are held from July to September. You will hear music played from a number of bars around town, which are where you should visit if you like to dance. Whether you’re travelling with friends or family, there’s something for everyone and thankfully, there aren’t any large clubbing crowds to worry about, so you can focus on having a chilled but extremely fun evening. For those who love shopping there are some excellent shops to explore, where you will find a range of items including beautifully designed and decorated ceramics, many of which featuring the lemons that the town is famous for. These are very unique, making the perfect souvenir you’re your Amalfi holiday. Handcrafted jewellery is also popular here, as well as delightful perfumes, soaps, scarfs and handmade parchment paper. Make sure you buy at least one bottle of Limoncello during your visit, as this tasty lemon liquor is made using lemons grown in the local area, just make sure you don’t have too much! Exploring the shops is a great way to spend an afternoon in the sun and it will also help you to get your bearings.